American professional wrestler. He said in a thisisInfamous interview "I'm 6'6, 270", although in a 2017 Podcast said "If you watched my career, you know I'm SIX-FOUR and 270 pounds but I move very well" and in 2018 "Six-Five". Yeah there are people who claim an inch shorter than they are, but it's more commonly going the other way. I have a relative who I've heard claim 5'9" even though I'd swear he looks a solid 5'10". It happens. I have another relative that claimed to be 6'5" and I suspect was only 6'3" range. He's in his late 60s now, and last time I saw him I felt almost an inch taller than him, I doubt the guy shrank 2.5" since his youth. All goes to say there are self downgraders, but they are rare and usually don't push the downgrade as far as self upgraders push their inaccuracy in magnitude. Guy at work we just hired checked his License into our Accounting Department. His license says 6'3", he himself says he is "6'2" in reality" and he is shorter than my other 6'1 coworker. No Wonder most woman can manipulate men at will. Men give off their insecurities right away!!! I've personally never met anyone who downgraded 2" of their height either. Never even met someone who downgraded a full inch. I've seen only one celeb here who claimed 2 inches below Rob's listing, but that assuming he's as tall as listed. A few actually downgrade their height, but it's very rare. And I'm using the term "downgrade" loosely here. I'm talking about rounding down 1/2" or 3/4" and not several inches. Can't seem to make up his mind but just over 6'4 sounds right. He said his own height was 6'4. He would never underlist it. C'mon man. Bellator listed him as 6’5” during his recent MMA debut. Id say he is closer to 6'5" then 6'4"
In MMA he is listed as 6'4". I can understand any guess in the 6'4" - 6'4.5" range. It's funny how Swagger was initially listed 6'5" here and the Average Guess is nearly 6'5". Goes to show you how a true 6'4" tends to be overestimated. I saw him Saturday and I was a little surprised. He’s definitely tall but I’d go maximum of 6 foot 4. I also met DDP (pic on DDPs page of the encounter) and would say they were about the same height. I’d guess closer to 6 foot 3.5 than 6 foot 4 and change. He was in very low soled sneakers though so that could be throwing it off a bit. Unfortunately I didn’t pony up the 20 bucks to take a pick with Swagger. 20 bucks is cheap these days! This guy is currently (or maybe) the most underlisted celebrity on this site. a 6'4.25" would do, and no one would bats an eye about it! Not to mention, I do believe many people 'mistake' Swagger at 6'5", like how Canson gets mistaken at 6'5" as well. I don't blame them. Also, Jack did edge out Randy Orton most of the time. Jack could be the full 6'4.25". He's one of the few guys who could be underlisted. Not to mention, I do believe many people 'mistake' Swagger at 6'5", like how Canson gets mistakened at 6'5" as well. I don't blame them. Also, Jack did edge out Randy Orton most of the time. I agree with you that Swagger's similar in height to Canson. 6'4 1/8" or 6'4" flat is the lowest I can ever see for Swagger. I have to admit. MAAYYYYBBBEE, 193.993 cm--6'4 3/8" in this case--could be closer. @Canson Feel free to disagree with me, but I kinda see Swagger near your height than say 6'3 7/8". He does look a big 6'4" guy. Average guess 1.6 cm higher than listed?! Swagger and wade barrett look exactley the same height too me. no way he is 6'4"
Rob, this guy played American football in college; you might be able to find some listing somewhere. Rob people might estimate him taller because of his head size? I'd have thought in person if it was smaller he'd look taller! He just said on a "Wikipedia fact check" spot on a podcast that he's 6'5 barefoot. 6'7 in wrestling boots. Seems close enough. Rob is 6ft4.25 still possible? Well, it's always arguable that when he said 6ft 4 he was rounding off a fraction, then on the other occasion he claimed 6ft 5, he's rounding up. I suppose he is one of the people out there who can look more than his lowest claim. Closer to 6'5 than 6'4. Rob maybe give him 6ft4 1/8 like you did with Darius? It's not unreasonable to put him as a strong 6ft 4 guy, I know many still estimate him nearer 6ft 5. Rob which superstar you think is taller between orton and swagger ?? Well, arguably both could fall into 6ft 4 and change category...I think giving Jack a little over 6ft 4 is reasonable. Maybe not as much as an inch but certainly like 1cm. There's no way he's the same height as Orton. He looks about an inch taller. I think he needs an upgrade. I'd say Rob should give this guy a fraction over 6'4". Somewhere in the 6'4" - 6'4.5" range is believable, so let's just list him at 6'4.25"! Celebheights is definitely interested in precision, so let's be precise. Editor Rob: in his honesty saying 6ft 4 it's quite possible he never bothered with giving a fraction. Swagger is the only one that springs to mind for me that I would say is or seems taller than his claim. Then again, probably just shows you how tall 6'4 really is. I honestly didn't bat an eyelid at 6'5, but I wouldn't have gone higher. So maybe he really is 6'4 and no shorter. Very honest on his part. Wouldn't it make sense for Swagger to just claim 6'5" if he was really 6'4.8"? One reason why I believe he's nearer to 6'4" than 6'5" is because he claimed 6'4". That would probably mean he's no more than 6'4.5"
The average guess is enough to say everything. Just see the difference between the listed height and average guess. who are 6'4" by a good fraction. Also looks pretty similar to Wade Barrett who is 6'5". Drew McIntyre is also around 6'5" and Swagger looks similar to him. Just because he knows that he might not be complete 6'5" and claimed to be 6'4" instead of claiming absolute fractions. Why does everybody say Swagger looked 2 or 2.5 inches taller than Batista in that gym photo? The top of Batista's head is at Swaggers eyebrow which would mean 4 inches difference in that photo wouldn't it? Swagger could be 6'4.5" and Dave 6'2". Click Here Wouldn't be surprised at all if Dave's 6'2" today. Saw in a recent Instagram post of Big Dave Batista w Jack Swagger and Jack Looked like 2'5' taller than Dave I think they were barefoot..If Swagger is actually not above 6'4' then Dave might be a weak 6'2'.. Rob do you agree he's a guy who can pull of looking taller than he really is in reality? Hence why you had him at 6ft5 before. Rob do you think he was being honest about being 270 pounds? Editor Rob: he could look that, I think for weight, there is a bigger range someone might fall within. His 6'4" claim seems some over the top honesty. Wade Barrett is 6'5" and I have seen him many times with him,he never looked an inch shorter. Forget about an inch he won't even look a bit shorter than Wade until both get measured.Before seeing his height on this page I always thought him to be either complete 6'5" or very close to 6'5" that is 6'4.75". He could possibly be 195 cm or more but I had to give him 6'4.5" just because of his 6'4" claim. People always claim more than their actual height and this man just decreased himself. Editor Rob: yeah a fraction over 6ft 4 of course is possible, maybe he was brutally honest and dropped any fraction from his newer claim. I think he is about 6'4.5". He is taller than 6'4" height. I will say he is 6'4.5" not 6'4". I really think this guy would be taller than guys like Billy Gunn or especially Rob Terry (no chance Swagger and Terry are the same height). I think Swagger's 6'4" claim is pretty honest, and certainly more accurate than the 6'6" one. Although I wouldn't rule out the possibility he's throwing away a small fraction. I think 6'4" - 6'4.5" is his range, nothing more and nothing less. He is billed at 6'7" but in real life he is more like 5'8". Trust me he is a dwarf guy but appears tall on TV. Now my fellow people will be happy and won't say to me that I inflate celebs. Might be rounding down, he always seemed to be 6'5 to me, the guy is huge. I don't get why Swagger and Michael Jordan are the same height about 6'4.5", yet Rob lists Swagger at 6'4" and lists Jordan at 6'5". WWE has even listed him at 6'7"
no denying he looks a bit taller than 6'4 guys like randy orton and billy gunn. Wow! He really said he's 6'6"? Well of course he did he's a pro wrestler lol. @Christian: I'm sure you'd edge him out too but I'd be very curious to see S.J.H or Ali Baba next to him to see how much taller they would be next to Him lol. Not sure if I would edge him or not you may be right may be my height. I think he's about 194cm. I would have guessed him to be 6'5 tbh. Rob do you agree with me that Jack Swagger is the tallest looking 6ft4 man ever? Editor Rob: I'd expect Joe would look tallest when standing tall. Rob do you think swagger could actually drop to 192cm late at night? Editor Rob: 6ft 4 is probably the minimum mark you could argue. I think he is within the 194 to 195 cm range. He seems much taller than he says he is. John Cena is 6'0.5" but saus he is 6'. Goldust is actually 6'4" but is 1 inch short than Swagger so something doesnt seem right with these heights. 6'4" is a joke. This man 6'5" at least. He's taller than Randy Orton and many others. He's too tall to be 6'4". Since when do the claims about height of celebrities have priority? John Cena´s claim: 6 - wrong. Big Show: a little over 7 - wrong. Hulk Hogan: 6-4 1/2 now - wrong. The Rock - 6-4 1/2 now - wrong. If he is 6'4" then Kane should be 6'6"
I think 6ft4 flat is low-balling him a bit even though he did claim it. Agree with Rob, 6'4" and change. No way. I met him in person out of gear and he is taller than 6'3 (6'4 in shoes). I met mojo Rawley who was measured 6'3 1/4 barefoot at the NFL draft and swagger noticably taller than him in person. Editor Rob: you could probably still argue that figure. For me, after seeing his new claim and looking at him with wrestlers, that might be the maximum I'd try to argue for him, the 6ft 4 and change range. He's definitely not just 6'4". He's more like 6'5". man hard to think Swagger is only 193cm considering he towered over guys like Orton and Edge, was even close to the Undertaker..i dont know if he wore lifts but i think he needs an upgrade to atleast 6'5' looks more believable imo..never doubted his 6'6' billing in WWE looked that tall..
No less than 6'4.25", probably similar to user Canson and just rounded down and claimed 6'4"
Judging by how tall other 193cm wrestlers look in the WWE I still find it VERY hard to believe he is only 6'4. I think he must be a solid 6'4.5 and like some 6'4 guys just rounds down. I mean randy Orton could potentially be 6'4.25 and seriously Orton edging out big Jack? I just can imagine it in a million years. Unknown- I do agree because he looks taller than randy orton on tv. Maybe its his hairstyle and physique that make him seem taller? Pretty crazy to think Swagger could only be 6'4 but then again I do remember some Indy wrestler claiming on Twitter that he's 6'5 and that he trained with Swagger and that Swagger wasn't taller than him. Surely Swagger was a lift wearer then seeing as he was taller than anyone else believed to be 6'4? It's crazy how wwe lists wrestlers like 4 or 5 inches taller than they actually are. They list swagger 6'7. 6'4" flat definitely seems more hard to believe, considering he definitely towers over Edge more than 2 inches in this segment Click Here. Maybe he forgot to round up his height to the nearest inch since all he knew that he definitely cleared the 76" mark. Kind of like what happened with John Cena or Kobe Bryant. Wow.. not even 6'5 now? This guy always looked mad tall on T.V. 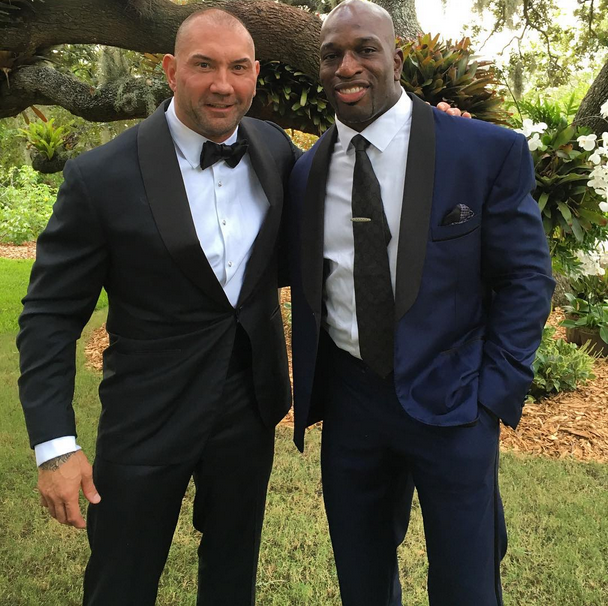 Only 6'4 flat is unreal..
Hey @rob he is more than an inch taller than titus o neil who is billed at 6'6" in wwe and titus is around 1 inch taller than batista who you have here listed at 6'2.75". What do you think? I just can't see him at a flat 6'4. He was always taller than Orton in WWE, who is a very solid 6'4 himself. Unless he was a lift wearer in WWE then I can't see Swagger anything below 6'4.5 and still IMO close to 6'5. Him being a flat 6'4 would throw a lot of things off. Swagger is about 2" taller than Goldust (see the pic at 3/31/15). Both man cant´t be 6-4, Rob! little over 7" - and thats wrong too. That guessed height is way off compared to Robs listing and Swagger's claim, lol. Editor Rob: admitted to being 6ft 4...good on him! 6´4"flat looks a bit low, comparing him to other wrestlers. I think hes a 6´4.5" guy claiming just 6´4"
Sorry about the rant rob but I just can't believe is he only 6'4 !!!!!!!!!!!!!!!!! Editor Rob: well I looked at him again with guys I've met and thought this guy isn't as big as I thought, then looked to see if he gave another height and there, this year he claims 6ft 4 out his mouth. Great to see him come out with a realistic height. WOW he was 6ft5 now he is only listed 6ft4!!! Yeah, good call Rob. I was about to mention the same thing to you about his height disclosure on a recent podcast. It is surprising, but the more I look at clips of him in the past, he does look bang on 6'4. He used to have spiky hair, and not to mention his great posture, could fool many to thinking he was taller. I knew he was not over 6'5, but somewhere in that range. Maybe 6'4.25 tops. 6'4" might be a bit low. 6'4.5" is better. His 6'4" claim was just a round-down, similar to when Kobe Bryant claimed 6'4". Plus Swagger looked only 1.5" shorter than 6'6" Baron Corbin. Just 6'4 flat? Seems too low. Not impossible he claimed six four and would measure something like 6'4.5 but still, most people think he's a solid 6'5! FLU, maybe you got it right. Big Jack recently came out and said he was 6ft 4...it's good to see honesty in wrestling. He is not that big. I'm 6'3" and he was MAYBE an inch taller than me, if that. Prob 6'5" with shoes. Swagger is another big farmhouse guy.... I always thought he was 6'7... I tend to make that mistake with 6'5 guys. I believe he is in the same range as guys like Wade Barrett. He has a lot of muscle on that big frame and its easy to see why he was so successful in wrestling and football. He may dip below 6'5 in the evening so max i could see is 6'5.25. Are you going to create a Cesaro page, Rob? Goldie is a legit 6'4"-6'5"
Unless Jack is wearing lifts, he is 6'6"
with goldust Click Here "
Barrett looks taller than Swagger. Thank you rob for adding jack swagger. Rob can you please add Wade Barrett. Barrett is likely 6'5.25/6'5.5 range. Swagger is a bit shorter at 6'5. Could even measure 6´5.5" I think. Antonio Cesaro looked 6'4 compared to Swagger maybe? Barrett does not look 6'6 if anything recently he's been looking 6'4.5-6'5 range. Goldust looks 6'3.5 there but swagger is closer to camera so i think he's around 6'4? 6'5 GUY WITH NORDIC FEATURES!!! Don't see how he's a weak anything. Swagger is legit 6'5. He does genuinely look this. I always find it amusing when a person who is naturally over 6'2" lies about their height. Shows that everyone has insecurities about height, tall or short. I'd say a weaker 6'5 would be more accurate but this is close enough. Rob how much does there look between kane and swagger here? I'd go with this too, he can look 6'5 most of the time, at worst a hair under it.